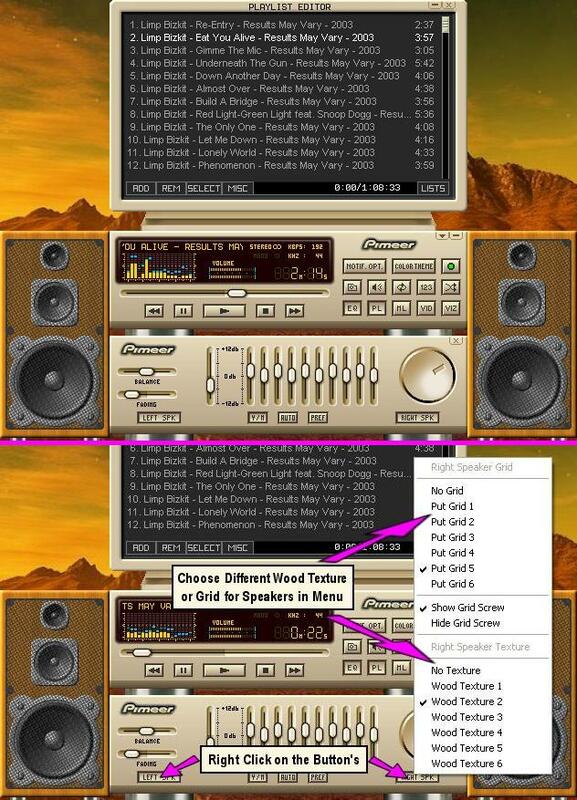 it's my first modern skin for winamp 5.03 or later. it represente a home cinema with player, equalizer, screens and speakers. it has also the opensource notifier. i put more than 6 months to carry it out. UPDATE FOR 2.2 : now you can choose a special grid, special wood textures and see (or not) screw for the speakers ! When you right clic on the main window you can make appear the color preferences and notification options. This tools appear on the main menu ... but all are represented by different buttons on the main window. You can choose a grid, special wood textures and see (or not) screw for the speakers ! You just have to select the equalizer, look at the button Right SPK (and of course Left SPK) and right clic on it. A special menu will appear. You will see that twice speakers can be adjusted separately. Very complete and good gfx! Excellent skin! I really like the speakers!! Great work! You should have included the speakers in the screenshot. thank you with all for your compliments. that's really a brilliant work!! Yeah! That's a much better screenshot for this very nice skin! Sympa ! du bon boulot, continue ! Could you tell me where to save this file, and then how to apply it to my winamp player please? Awesome skin. The only thing I would have changed is the jaggies on the volume dial. Other than that I would have given this skin a ten for sure. Really nice details and features on this one. I just turned on the player and the speakers actually bounced. Okay, okay, it gets a ten. In spite of the volume jaggies. We need a higher rating then 10 for this one. I think you got it figured out. Its what the people want but dont have yet. Killer skin my man!!! Thank-you Q70 for the install advise. Should be able to rename the .zip to .wsz and double-click. If Winamp is associated right it'll just install it/load it. Great skin. Been using this for awhile now. Only wish I could make the speakers come up by default on opening.